BookNook — Young Adult book reviewsUnremembered has everything I love in a sci-fi: genetics, evil corporations, love, technology, and conspiracy. It's almost like it was made for me! However, I have to warn you. This story isn't exactly original. It's awesome, and I loved it, but it is one of those things that has been done many, many times. It just so happens to be a "cookie cutter" that I adore, so it didn't bother me in the slightest. But if that WOULD bother you, then this book is not for you.However, despite my love for this book, it wasn't perfect. And I'll address some of the frustrating things first:The first ~35% of the book is clouded in mystery as the girl—Seraphina—attempts to answer all of the questions in the blurb. Why wasn't she on the manifest? Was she actually on the plane? Why aren't her fingerprints and DNA in any of the databases? This was the first frustrating thing for me, because I thought the answer was obvious, but we don't get the reveal until the 35% mark. I honestly already had a good idea of what the 'secret' was from the synopsis alone. Now, that doesn't mean the beginning was terribly boring or painful for me to read, but I did get frustrated at times because it felt like it took her AGES to figure it out.My one other problem is with the romance. I wanted to love the romance, and there was definitely potential there, but I didn't; I didn't hate it, I just didn't love it. The problem is that memory loss aside, Seraphina and Zen are already in love when the story begins. This is just a universal thing for me: I can't love a romance if I don't see it develop from the beginning. If you don't have that problem, then you might love this romance! But as much as I tried, I just didn't connect to it fully. Zen is totally a sweet character, and with more development I think I could have really loved the romance, but it just wasn't all there for me. There are some flashbacks to help us relive the beginning of the romance, but again, it just wasn't quite enough to get me to love it.Okay, moving on! Overall, I adored this book. It is super action-packed and there are loads of twists and turns. There is one twist in particular that I feel like I'm a bit stupid for not having seen coming, but OMG it blew me away and I LOVED it!! Towards the end, it was a bit of a mindfuck at times, but that's one of the things that really drew me in. 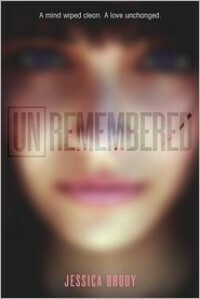 I love a complex story that can be so baffling that you need to take a time out to process it.Unremembered also has a great ending. This is the first book in the series, so there is still an opening for it to be continued, but things do get wrapped up super nicely and there's not much of a cliffhanger. And despite my lack of enthusiasm for the romance, the ending still had me Awww'ing!I kind of feel like I'm not saying enough with this review, but the problem is that all the juicy bits are spoilers! There's so much that I want to say, but I can't say it because I don't want to ruin the story for anyone. This book is almost like putting together a puzzle. There are so many pieces that Seraphina picks up along the way, but then everything at the end comes together beautifully to form an overall picture that finally makes sense. Even the small details that you thought you had figured out, suddenly come into focus even more at the end.If it doesn't bother you that this plot has "been done before" (click the spoiler tag to see what I mean. It is sort of a spoiler, but it gets revealed at the 35% mark—so not that far in) Seraphina was actually "created" in a lab. She is a genetically enhanced human/robot combination. The corporation who created her intended for her to be the 'perfect' human and she escaped from their facility. Now they're after her to get their trillion dollar project back. then I highly recommend this book! It's a great story and will definitely keep you engaged!